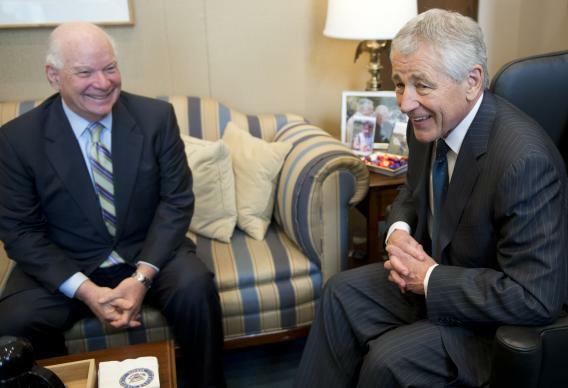 Former US Senator Chuck Hagel (R), US President Barack Obama’s nominee for Defense Secretary, meets with Maryland Democratic Senator Ben Cardin on Capitol Hill in Washington, DC, on January 23, 2013. Portraying itself as a gay rights group, it has sent mailers to voters in seven states — including New York, New Jersey, Maryland and Montana — and run television ads against Mr. Hagel in New York and Washington. So: The only body that gets to vote on a Hagel nomination is the United States Senate. Thirty-four of its members are up for re-election in 2014. There are no Senate races in New York or Maryland that year. In New Jersey, the next senator facing re-election is Frank Lautenberg, an 89-year-old Democrat who badly trails primary challenger Cory Booker. In Montana, voters will get to decide again on Max Baucus, who put away his last serious challenger 12 years ago with a TV ad shaming him for his old grooming business. Basically, the Republican looked really gay. I’m having a decent time of this journalism thing, but if anyone wants to throw some money away, I’d more than happily put together an ineffective campaign against Chuck Hagel. Start the bidding at $250,000.